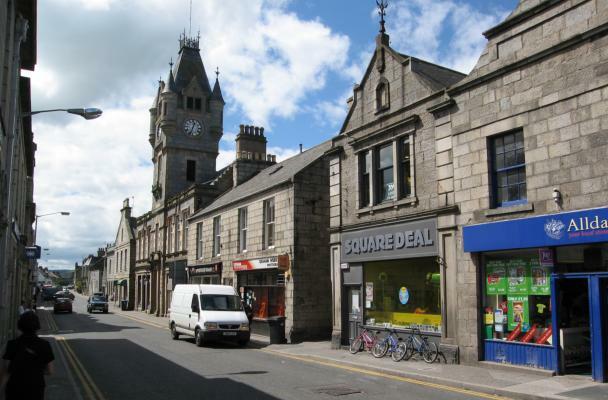 Huntly High Street @ High.St - High Street shops and High St businesses. Large Google map of Huntly High St.
Huntly is situated just off the A96, nearly 40 miles (60Km) West of Aberdeen on the main road to Inverness in the Highlands. It is a pretty town, close enough for the oil workers but sufficiently far away to preserve its identity and centre of over 100 mainly independent shops and businesses. These are centred on The Square with Castle St to the North, Gordon St to the South and Duke St to the East. All these are shown below. Huntly has a number of interesting old buildings and a Town Trail has been set up to provide an interesting introduction to these historical monuments. Leaflets are available at the Tourist Information Centre in the Square or a walk-through of the trail can be viewed on the Huntly Community website. The Castle Trail comprises 13 castles around Aberdeenshire. Among them is Huntly Castle, otherwise known as Stathbogie Castle. This is a splendid, largely intact, ruin standing on the banks of the River Deveron. The 4 star Castle Hotel is nearby. North East Falconry is located at Drumdelgie, about 3 miles from Huntly towards Dufftown. There are regular flying displays and falcon handling courses. Huntly Herbs is also just outside Huntly and offers a unique range of organic culinary, medicinal and dyeing herbs. There is more information on the Huntly online website and the Huntly Community website.